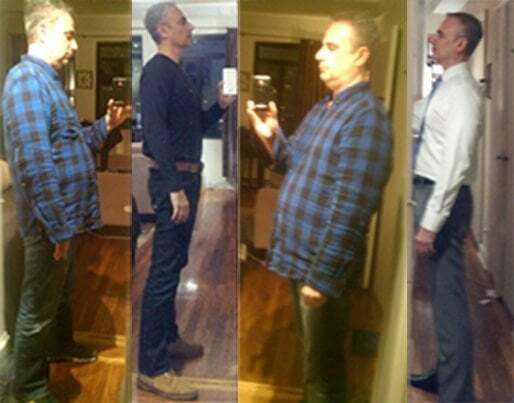 “So, who would have believed that I am publishing my own weight loss before and after pictures? I never imagined doing one of those shots, a before and after, but I had to see it for myself and plenty of people were asking me if I had any earlier photos. They had definitely remembered that I had been quite a bit chunkier, but over the course of time when you see someone, those memories fade and no one thought there had been much of a change. I wrote the above back on December 4th, 2012, six months after starting Hashi Mashi. After 7 years, I think it is fair to say that Hashi Mashi is one great way to lose weight. It is of course not the only way. But, it is the first diet plan that helped me both lose and maintain weight loss for such a long time. That I believe is a weight loss success story. “I took the shot on the right this last Sunday and have been looking through some older photos. I have not been able to find a photo from June 20, 2011 so far, which is the day before I started, and will keep looking. You could say that it was somewhat spontaneous, because it was, I was not planning to start and did not really have the idea in my mind, but that day on June 20, I felt so uncomfortable that I knew, I just had to do something else, something even if it would be considered drastic. Now I am getting pretty close to six months and I am working on applying what I have learned from this journey so far to other areas of my life. I will write a separate post regarding that. My experience is that the greatest weight loss tips on the planet only needs 5 words. Eat real food & start moving. Yes, that's it. I imagine this sounds absurd. If losing weight was this easy, why are there thousands of weight loss books on the market. Believe it or not, as of today on April 3, 2019, Amazon lists over 50,000 diet books. For many decades, many different diet and exercise book authors have come to teach you how to lose weight and get fit. And you know what happened? The opposite. Since the 1950s and the 1960s, Americans weigh more than ever. After 50 years of diet books, you need to make an end to dieting. Learning how to reach your ideal weight is as natural as breathing. Whether you need to lose 10 pounds or 100 pounds, you need to start eating real food. Losing weight is not about small meals or small plates, or some other type of special tricks using calories counters and food scales. The first step is for you to start eating real food that grew from the ground, like plant food. Or grew from an egg, like animal food. You will reach your goal weight faster than you ever thought possible, if you just start eating real food. Fast food is convenience food. You don't feel like cooking up a bowl of oatmeal which takes 5 minutes. This is understandable because you are in a rush. So instead, you pick up a blueberry muffin before you start working. Think about the so called food that you eat all day long. Is it real? Did it grow anywhere? Is your first meal of the day made up of real food? What do you eat before you start your day? Oh, nothing? Starving is one of the worst ways to lose weight. Does your day start with a muffin or a bagel? Not that there is anything so wrong with that, but, the further your fuel is from real food, the more weight you are carrying on your body. Food is not your enemy. Food is your friend. Processed food and junk food and fast food, now that is a problem. But real food will help you unleash your real body. People gain weight because they primarily eat processed food and do not move enough. For example, walking at least 30 minutes a day. And your preference for convenience and fast food is not your fault. Like anyone else in the modern world, you were raised on ‘modern' foods. But, you just can't improve on the quality of fresh vegetables, grains, proteins, fats and fruits. A snickers bar is never going to give you the nutrition of some almonds, real chocolate and raisins. An oreo cookie fails to provide your body with the vitamins and minerals it needs to do its job. This will explain to you why after an entire day of noshing (snacking) on convenience foods, you are still hungry at midnight. This idea came to me one evening when I went out for another blueberry muffin. After a whole day of eating fast foods. That was my ‘Hashi Mashi' moment. I believed my body was telling me that I was not providing the nutrients needed. So, the next day, I changed the quality of the food, and suddenly I began to look and feel better immediately. Isn't that what you want, to look and feel better? If yes, the recipe to do so is not as complicated as you think. In the past, whenever my doctor told me that I had to lose weight, I didn't know how. But now you know the 5 word secret – eat real food and move. If you are overweight or obese today, don t feel that it is your fault and that you have no options. This is completely not true. And just plain old not looking and feeling good. You deserve to look and feel your best. Only 30 days of real food will help you see the difference. And you can easily lose 20 pounds in 3 months following a very simple plan. What a shame it is when your weight loss plan is to not eat. Starvation will not work. Did you ever starve your body most of the day and wonder why you didn't lose weight? The reason is because your body is much smarter than you. Your body expects to be fueled so it can do its job of keeping you alive. and catabolism, the opposite, breaking down complex molecules to simple. Clearly, you have no clue how to execute these complex chemical reactions. No matter what degree you have. Your body is an amazing and beautiful creation. Treat it as such and you will see the magic of body transformation. Because you will not be losing weight, your body will start to transform. Once you give your body the nutrients and movement that it needs to function. The second pillar is to start moving. No, you do not have to go out there and start doing crossfit or powerlifting. All you have to do is start moving. Get up from your desk, walk around, move your body. You don't have to do anything more complicated than walking. And walking alone will wake up your entire body. Suddenly, your body will know that you intend to use the muscles you are born with. Your skeletal muscles are designed to move your skeleton, your body. If you sit all day from morning to night, you are not using your body as designed. This will result in breakdown of your body. Scientists have even coined the term Sitting Disease to refer to the complications of sitting too much. At the minimum, you need to walk every day for at least 30 minutes. You can make this happen by parking further from your stop. Or getting off the bus further from your place at work. If it is too cold, walk in your house, get an elliptical or treadmill. In the old days, you'd walk up and down your field farming. But, in the modern world, you need some modern equipment to exercise your body. Your body deserves to move and be fit. Move it. After you have started exercising for a while, your body will get conditioned enough to start weight training. As you lose weight, you also want to build muscle if you want to dramatically change your body from fat to fit. I think weight training is a great option for people who are overweight. Because when you are heavy, it is not easy to do body weight exercises. For example, back when I was 55 in the photo on the left below, I could not do one pushup. Outside of walking, I had no other way to do strength training. You do not only want to lose weight, you want to build muscle as well. And building muscle requires progressive resistance training. Either the resistance will come from your own body, or from barbells, dumbbells or weight training machines. If you cannot do a pushup, then what can you do for resistance training? After I lost 20 pounds in 3 months, I wanted to do some strength training. But, I knew that in the past, no matter how many times I did dumbbell curls or shoulder presses in the gym, I never saw results. I was intimidated whenever I saw the free weight area at the YMCA Vanderbilt on 48th street in New York City. The people in there were very fit and muscular, and appeared to be athletes or bodybuilders. But, I started to do some research on the difference of doing curls to doing deadlifts. Once you understand the number of deadlift muscles worked versus curls, you will immediately choose the deadlift. The curl targets a few small muscles in your body, the biceps. Whereas the deadlift targets all the muscles of your body. From head to toe. If you only have time for one strength training exercise – choose the deadlift. Why spend your precious time in the gym and see little results? You don't just want to be a smaller version of yourself, you want to transform your body. The deadlift will change your body from fat to fit. As opposed to the squat, the deadlift is a great choice for people who are over 40 or 50. The squat requires greater range of motion and is harder on the knees without proper form. On the other hand, as long as you can still bend down, you can deadlift. Even a 75 year old grandmother started deadlifting and improved her mobility. Shirley Webb is deadlifting and now competes in powerlifting at the age of 81 today. How to lose 20 pounds in 3 months using 5 simple steps will get you started on your weight loss journey. Similarly this one great beginner deadlift workout will start you off on your strength training. There are many deadlift workouts that you can do, but that one beginner deadlift workout is what I use and it still works well for me at age 62. No matter what deadlift workout you choose, you need to be very careful with deadlift form. Even though the deadlift looks simple; you just bend down and pick up the barbell. It is not. If you want to be successful in deadlifting to reshape your body, you have to avoid injuries. To avoid injury, I recommend you use the essential proper form deadlift checklist. I also recommend that you use a 12 week deadlift program for beginners in fitness to map your results. Resistance training yields results when it is progressive. Last but not least, these 39 top deadlift tips for beginners and 5 simple steps to deadlift like a boss will help you along. After 3 to 6 months, you will easily lose the 20 to 75 pounds that you want. Without suffering. 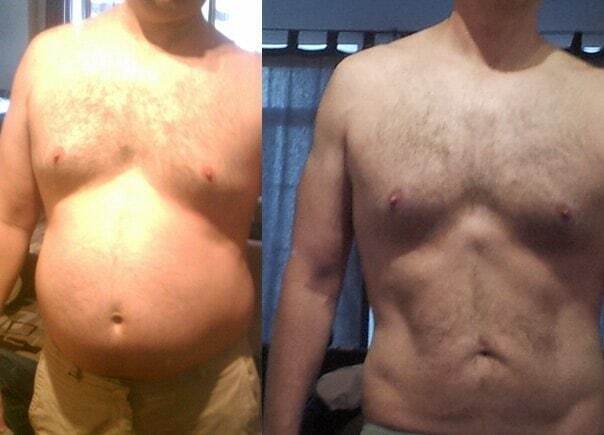 If you think that is impossible, just read my own story of how I lost 75 pounds in 6 months. 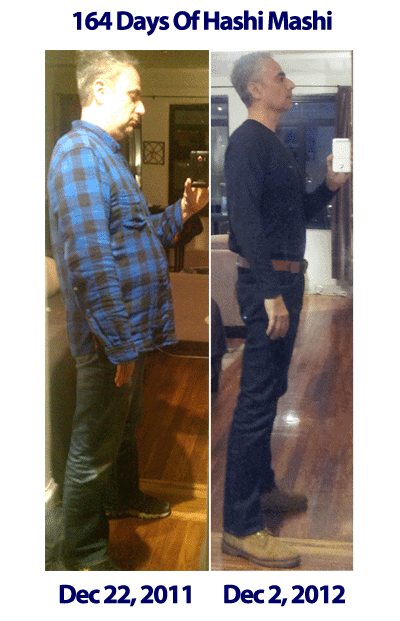 Using the same process, I lost 100 pounds in total over a 15 month period. The system is the same whatever the amount of weight you need to lose. So, one day you might write how you lost 120 pounds or 10 pound. From walking, you progress to strength training. And as you see above I highly recommend the deadlift as an excellent tool to build strength and mobility. You do not need 50,000 diet and exercise books to lose weight and get fit. All you need are the two pillars of body transformation. Just 5 words – “Eat Real Food and Move”. 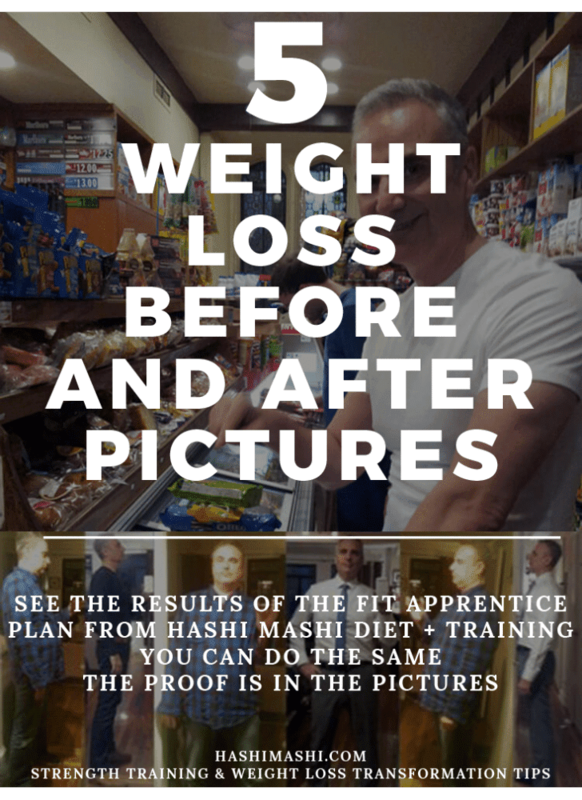 Hashi Mashi weight loss + strength training transformation tips is based on those 5 words. “Eat Real Food and Move” – this will help you look and feel better than ever. You will finally be able to fit in a suit off the rack. I guarantee that will be a great moment. Good luck on your own weight loss and strength training journey! Feel free to contact me any time for help or encouragement. Took this shot 175 days into Hashi Mashi Diet + Training. The suit fit off of the rack, finally.